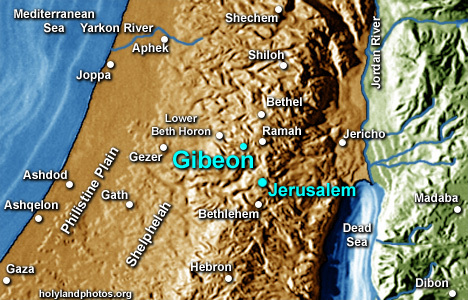 Gibeon (el-Jib) is located 5.6 mi. [9 km.] northwest of Jerusalem in the Central Benjamin Plateau. It was the chief city of the Gibeonite League that Joshua made a treaty with (Joshua 9–11). It guarded the natural approaches to Jerusalem from the Coastal Plain via the Beth Horon or Kiriath Jearim Ridges and was attacked by the Adoni–Zedek the king of Jerusalem, but defended by Joshua and the Israelites. It was assigned to the tribe of Benjamin (Josh 18:25) and was a Levitical city (Josh 21:17). It is mentioned 37 times in the Hebrew Bible. It may have been the “home town” of Saul (1 Chron 9:35-39).